Last night Jack White rounded out his album release week with a mighty show at the Fox Pomona, his third and final L.A.-area show for this tour. Lazaretto, released Tuesday, comes on the heels of White’s controversial comments blasting the Black Keys in a recent Rolling Stone cover story. His dismissive remarks about the Ohio band and his conversations, or lack thereof, with former band mate Meg White may have ruffled enough feathers to warrant an apology on his site (which looks like it’s been deleted), but they didn’t do a thing to dampen the crowd’s ardor on Thursday night. A crewmember, easily identified by the White team’s signature bowler hats, walked on stage before the set to ask the audience to avoid experiencing the show at a later date and put away their smartphones. (White employs his own photographer to put images online for fans.) Far more surprising than the request was the fact that the audience, for the most part, listened. For all mystery and eccentricity woven into his mad-genius image—he’s often referred to as the Willy Wonka of rock—he seemed at ease on stage, content and comfortable connecting with the audience. He urged attendees to make more noise and regaled them with the tale of how he was once booked to play Pomona… Pomona, Montana. The error had him high-tailing it from San Diego to Montana in 12 hours. White played fewer songs than he did at this week’s other L.A. gigs, Tuesday at the Fonda and Wednesday at the Mayan. Unlike the latter, fans at the Fox weren’t treated to appearances from Conan O’Brien or John C. Reilly, but they did get to witness a softer moment with “We’re Going to Be Friends.” The building rattled again as he closed with one of the most recognizable riffs in modern rock, “Seven Nation Army,” which saw the audience losing its collective mind. Fans shouted the melody at White and he let them carry it as he smiled back. 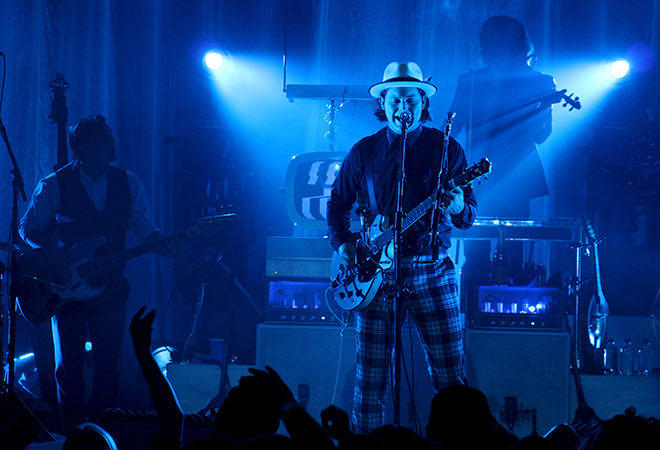 You can watch Jack White’s album-release show at the Fonda earlier this week.